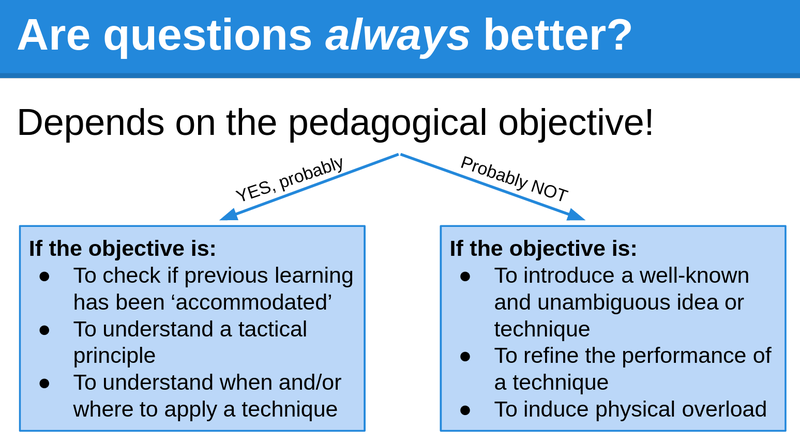 Ever since Socrates first interrogated the young people of Athens back around 420BC, question-based pedagogy has been a cornerstone of teaching methodology in the west. However, the idea that questions facilitate effective learning is more ideology than science. Don’t get me wrong: many books have been written on the value of questions; Ofsted suggest questions are a feature of ‘outstanding’ teaching; and many coaches attest to the power and value of asking rather than showing and telling. Yet good teaching and coaching must involve a mix of communication behaviours. The question, therefore, is not whether or not to use questions, but when? And under what circumstances? And how to use them with greatest effect? This article attempts to answer these questions and offer a simple methodology for coaches of all levels interested in enhancing their questioning repertoire. When are questions most useful? First, I want to examine the role of the shot in the game – when and where we might want to shoot (tactical stuff) – so I use games and questions to draw attention to this. Once this has been understood, and players are making good decisions about shooting and doing so happily, I want to improve their technique. The physical principles of good shooting are well known – a release angle between 50-55 degrees, for example, leads to optimal angle of entry, increasing margin for error – so I don’t need to allow the players to discover this them for themselves. It would be a waste of time. So I ‘show and tell’ and allow lots of repetitive practice. Very traditional! Finally, knowing that each player will be most comfortable with slight variations on the standard technique, I may use questions again to draw their attention to small differences to help them build confidence in their own form; to notice deviations and to self-correct if necessary. The point, of course, is to use the appropriate behaviour to meet the objectives. I often come across coaches who declare blind allegiance to one extreme or the other. Both are wrong. How can you make the most of questions? Having chosen the right time and place to use questions – e.g. in a session aimed at understanding when and where to use a jump shot – you are ready to consider your method. With twenty years’ experience, and being lucky enough to study this for my job (I have used Walsh & Sattes’ book and also Lynn Kidman’s work), I’ve come up with a six-stage process that I think leads to good results: The Six Ps. Just a couple of warnings before I start: first, it’s important not to expect an instant response, especially if your athletes are used to being ordered around; second, it’s worth remembering that this strategy is an ideal type, and you may not always make use of all six steps. To explain, a question must first be linked to the PURPOSE of the session. In my example, I may start by planning to ask: “when is it a good time to use a jump shot?”. I would then PRIME the group by asking the question, but without expecting a response. The idea is to give them something to focus on. The next step is difficult: I need to design a game or activity that requires the players to solve the problem posed by the question. They have to PLAY a game that poses the question, over and over. During play, I can remind them of the question without stopping things. It is also really important to observe carefully and look out for ‘teachable moments‘: those instances when you see someone answer the question emphatically in their play (e.g. seeing a player catch and shoot quickly when open). I would use this moment to pause the session and PRESENT the question again, this time looking for an answer. The important thing here is to give learners an equal chance to respond. One way of doing this is to ask the question, then allow them to group off and discuss answers for 30 seconds or so. I can then ask for a response from each group in turn without the social pressure of giving a “wrong” answer (it’s a group answer, not a personal one). The real skill of questioning, then, lies in your ability to PROBE responses. This requires practice, patience, active listening skills (nodding, make approving noises) and an understanding of where you want to go with the question (back to the purpose). Another important consideration here is to allow a little thinking time. Coaches are often uncomfortable with silence and often “rescue” the situation by jumping back in to answer their own questions. This urge has to be resisted. If a Q&A session has been conducted well, it will have lasted a few minutes, with a few lines of discussion explored (e.g. 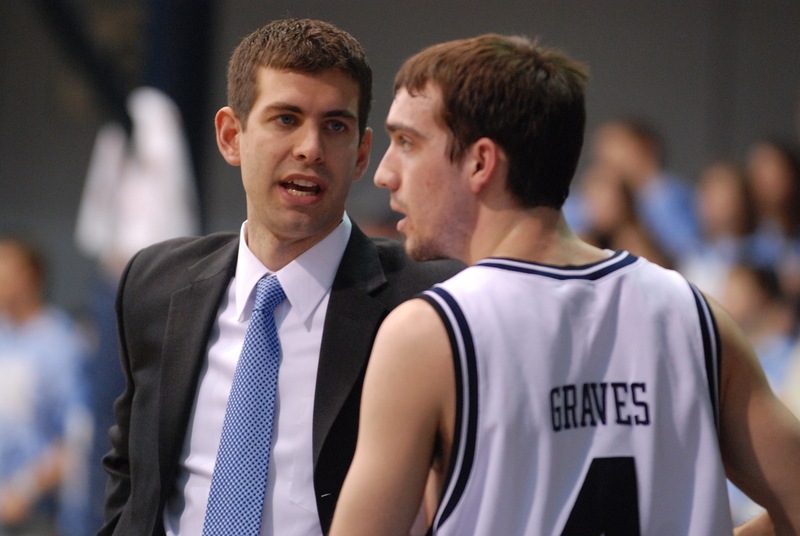 good places on the court to shoot; good situations to shoot; where players are confident shooting from etc. ), so it’s important to conclude with a recap and refocus on the key messages. The final step, then, is to PROGRESS the question. This could be a simple link into the skill refinement session (can you get your feet set earlier? ), or a challenge to individual players in a progressed game (can you get more shots away before getting closed down?). Whatever the case, there needs to be both connection and extension. This entry was posted in Communication and tagged Implicit learning, Questioning, Socrates. Bookmark the permalink.